When you're viewing feeds the Options menu is located at the bottom of the page. 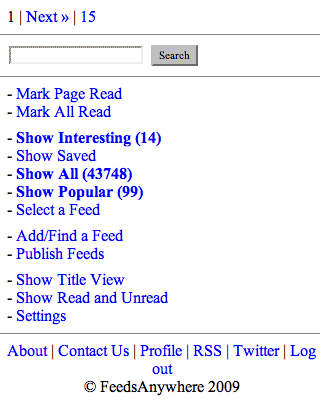 It's where you'll select your view, mark pages read, and add new feeds. The link is one way to jump to the next articles in the feed, but you might find yourself using more often. It functions the same as except it also marks the articles you just viewed as read so they won't show up next time you're only looking at unread articles. The numbers in parentheses indicates unread articles. This particular user subscribes to a large number of feeds, relies mostly on the Interesting Feed, and doesn't worry about reading everything. It's an efficient way to read what's important without becoming overwhelmed. This concludes our feature tour. Give FeedsAnywhere a try. We think you'll like it.